Some movies are simply “jewelry heavy” where the film relies on jewelry as if it were a co-star, enhancing the beauty of the film…and the lead actress of course. 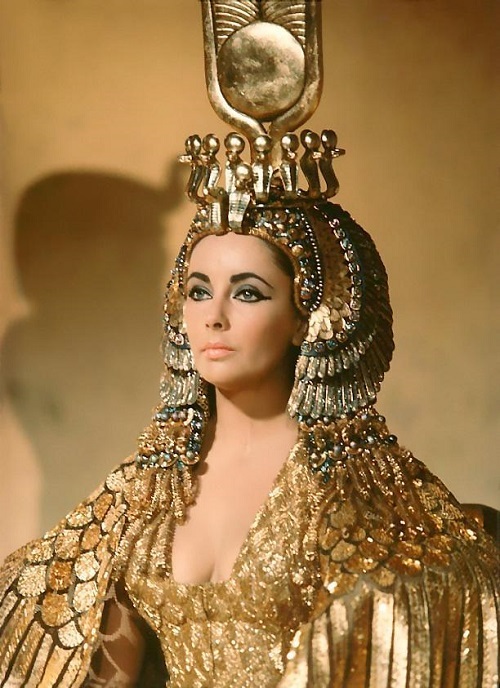 Cleopatra is one such movie where the jewelry lovin’ queen played by jewelry lovin’ actress Elizabeth Taylor stunned theater goers with her staggering array of gold dripping costumes. Here are some other fun facts about Cleopatra (found in AnOther) you might not know. 1. Taylor’s 24-carat gold cloth cape, designed to look like the wings of a phoenix, was intricately assembled from thin strips of gold leather and embellished with thousands of seed beads, bugle beads and bead-anchored sequins. 2. A colossal total of 26,000 costumes were created for the film. 3. Taylor had 65 costume changes in Cleopatra, a record for a motion picture at the time. 4. She was allocated an incredible $194,800 (£123,000) wardrobe budget. 5. Costume designer Renie Conley won the 1963 Academy Award for Best Costume Design (along with Irene Sharaff and Vittorio Nino Novarese), for her creation of Taylor’s stunning gowns, which placed emphasis on the actress’ beauty and sexuality over historical accuracy. 6. Sartorially, the film was extremely influential, popularising snake rings, arm cuffs, geometric haircuts and maxi dresses, as well as the “Cleopatra Eye” makeup trend – a 60s Revlon commercial promoted Cleopatra “Sphinx Eyes”. 7. According to Rex Harrison’s autobiography, Fox custom-made the boots for his character Julius Caesar while Richard Burton’s boots were Stephen Boyd hand-me-downs from the previous attempt at making the film. Harrison was amazed that Burton did not complain. 8. The armies of extras alone were issued 8,000 pairs of shoes. 9. Taylor’s iconic gold cape sold at auction for $59,375 in 2012. Prior to that it had been stored in a cedar closet, finely wrapped in tissue paper. 10. The female extras complained about their overly tight and revealing costumes, which they said provoked wandering fingers among the male ensemble. The studio eventually hired a special guard to protect them. Costume Jewelry – A Cheap and Easy Way to be Outrageous!